First line: Sarah Wells stood on the roof of the carport and snaked her gloved hand through the hole she'd cut in the glass. From the inside cover: A young mother and her infant child are ruthlessly gunned down while returning to their car in the garage of a shopping mall. There are no witnesses, and Detective Lindsay Boxer is left with only one shred of evidence: a cryptic message scrawled across the windshield in bloodred lipstick. Lindsay spends every waking hour working with her partner, Rich - and her desire for him threatens to tear apart both her engagement and the Women's Murder Club. Before Lindsay and her friends can piece together either case, one of the killers forces Lindsay to put her own life on the line - but is it enough to save the city? With unparalleled danger and explosive action, The 9th Judgment is James Patterson at his compelling, unstoppable best! My thoughts: I love this series and this latest installment didn't disappoint. It is the 9th in the Women's Murder Club series and we once again get to catch up with the four friends, Lindsay, Claire, Suki and Cindy. The plot was fast paced and engaging, with two separate storylines running parallel that ultimately merge. One case involves a string of burglaries of the rich and you actually end up sympathizing at times with the 'thief.' The second case involves a disturbed individual killing mothers and children. It is gruesome and hard to take, but seems to be balanced by the cat burglar, aptly named "Hello Kitty.' The chapters were short and to the point, which made the jumping back and forth from one case to the other easier to follow.9th Judgment is everything that I have come to expect from James Patterson's mystery thrillers - it shocks, teases and keeps you hanging on to the very end. Giveaway extended until Saturday, July 3rd, 6:00 PM EST. "It's the life cycle of the butterflies that gets me to thinking," she told them when asked whether the newly instated garden had increased her quality of life at the facility. "I'm old and frail," she went on, "but like those butterflies need flowers, I need people. I crave the company of others." From Christine: Between today and July 1 when Sand in my Eyes releases, I am giving away some of the best beach books of summer! Pre-order Christine Lemmon's new book, Sand in my Eyes , from Amazon now, email your receipt to jclemmon@gmail.com with subject line Beach Bag Giveaway, and you'll be entered to win a beach bag full of 7 fabulous new summer beach reads including Seven Year Switch by Claire Cook, The Island by Elin Hilderbrand, Fly Away Home by Jennifer Weiner, The One That I Want by Allison Winn Scotch, The Opposite of Me by Sarah Pekkanen, The Nobodies Album by Carolyn Parkhurst and Thin Rich Pretty by Beth Harbison. Added bonus: sweet pair of women's Oakley sunglasses and a $50 Amazon gift card for even more reading fun. I've heard great things about all these books - some I have either already read or will be reading for blog tours. If you win, please come back and tell me all about it! Good Luck!!!! First line: It happened every year, was almost a ritual. 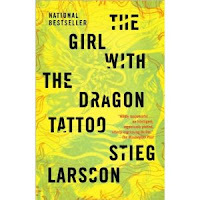 From the back cover: Stieg Larsson's The Girl with the Dragon Tattoo combines murder mystery, family saga, love story, and financial intrigue into a complex and atmospheric novel. Harriet Vanger, a scion of one of Sweden's wealthiest families disappeared over forty years ago. All these years later, her aged uncle continues to seek the truth. He hires Mikael Blomkvist, a crusading journalist recently trapped by a libel conviction, to investigate. 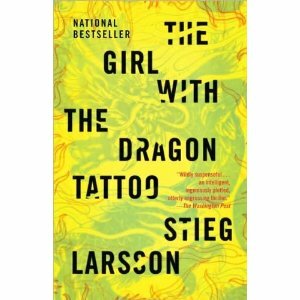 He is aided by the pierced and tattooed punk prodigy Lisbeth Salander. Together they tap into a vein of iniquity and corruption. My thoughts: This was my book club selection for June and I am so glad it was. I had purchased this book and the next one in the trilogy, The Girl Who Played With Fire, but they were just sitting on my shelf - not that I didn't want to read them, but for some reason I was reluctant to pick them up. Not that I should have worried about it, because this was a fast moving book filled with suspense, deception, crime, family secrets, and intrigue. With the several plots going on at the same time, I was totally engrossed. Stieg Larsson goes into great detail about every character and even gives us plenty of background on the situations the characters are in. There's even a family tree in the beginning of the book, which with all the Swedish names, I had to keep referring to as I progressed through the book. Particularly interesting were the statistics at the beginning of each part in the book - each having to do with assault against women - and each one seemed worse than the one that came before. I am very anxious to read the rest of this trilogy and hope they continue to be as intriguing as this first one was. First line: Light from April's full moon swept over the Museum's facade and down the building's marble veneer. From the inside cover: Bartholomew Fortuno, the World's Thinnest Man, believes that his unusual body is a gift. Hired by none other than P.T. Barnum to work at his spectacular American Museum - a modern marvel of macabre displays and live performances by Barnum's cast of freaks and oddities - Fortuno has reached the pinnacle of his career. But after a decade of solid performance, he finds his contentment flagging. When a carriage pulls up outside the museum in the dead of night, bearing Barnum and a mysterious veiled woman, rumored to be a new performer, Fortuno's curiosity is piqued. And when Barnum asks Fortuno to follow her and report back on her whereabouts, his world is turned upside-down. Why is Barnum so obsessed with this woman? Who is she, really? And why has she taken such a hold on the hearts of those around her? As Fortuno searches for the truth, the other performers face trials of their own: Small fires keep erupting in the halls of the museum, and while alert residents quickly dowse them with water, an arsonist clearly lives among them. As the fires grow in size and number, it seems to be only a matter of time before their home will burn down, and so the hunt for the fire-setter is on. Set in mid-nineteenth century Manhattan, a time when carriage rattled down cobblestone streets, raucous bordellos thrived, and the country was mourning the death of President Lincoln, The Transformation of Bartholomew Fortuno is a moving novel about human appetites and longings. With pitch-perfect prose, Ellen Bryson explores what is means to be profoundly unique - and the power of love to transcend even the greatest divisions. My thoughts: I found this to be quite an interesting read. Set at the end of the Civil War and focusing on Barnum's museum of "curiosities," it is a tale of acceptance of yourself and of others. Ellen Bryson manages to not only humanize the "curiosities" - but shows us the beauty of their strange physicalities. The story of Bartholomew Fortuno and his unique friends at the museum is a thought-provoking one, yet also filled with a little romance and suspense. Are the "quirks" people have due to birth or circumstances of nature? I found this book beautifully written and thought Ellen Bryson created a vivid sense of place. At times I felt as if I was right there in the museum, able to see all the strangeness that people paid to see - which I am amazed actually happened! I am looking forward to seeing what comes next for Ellen Bryson. 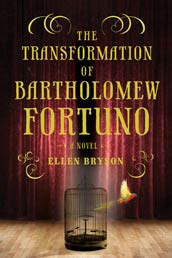 I received a complimentary copy of The Transformation of Bartholomew Fortuno by Ellen Bryson from Henry Holt and Company Publishers to review. PLEASE LEAVE A COMMENT with either the link to your own Musing Mondays post, or share your opinion in a comment here (if you don’t have a blog). Thanks. For me, it totally depends on the genre and/or author. If the book is not in a genre I read, I am not as likely to pick it up. If it is in a genre I read, I am more likely to read it, although I might wait for the hype to die down. For example, I did not read any of the Twilight books because I am not a fan of vampires. I have no interest in reading these books no matter how much hype they have gotten. As for the Harry Potter books, I did read them, at least the first six - I still need to see the 6th movie and then I will read book seven. I really enjoyed these books and picked up the first one right before the movie had come out. Giveaway extended until Wednesday, June 30th, 6:00 PM EST. "Why didn't you come see me last night?" Martina looked up at my reflection in her makeup mirror. "The second I'm finished, you're to tell me everything that happened on your" - she looked around the Green Room - "you know, your trip." Julie over at My Book Retreat is hosting the Summer Reading Challenge. The challenge is to pick books you would like to read this summer and then keep a record of how you do. The challenge runs from June 21 to September 21. If you'd like to join, head over here to sign up. This is a combination of books I need to review as well as books I have on my TBR pile and my book club selection for next month. I think I should be able to get through all these, plus a few others. Wish me luck! Let me know if you are joining so I can see your list! Name your top 2-3 favorite genres (the ones you read most from). My top three genres would be women's fiction, cozy mysteries and historical fiction. 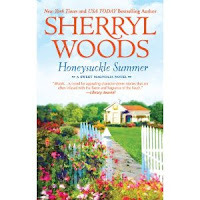 I love women's fiction because I love to read about relationships between sisters, mother and daughters, husbands and wives, good friends, etc. I love the emotional pull of these stories, and if there is a little romance thrown in, all the better. Some of my favorite authors of this genre are Luanne Rice, Debbie Macomber, Sherryl Woods, Kristin Hannah, and Jane Austen. Cozy mysteries are great because they don't include all the gore of a hard-core thriller. I especially enjoy all the cozies that are based on hobbies - tea drinking, scrapbooking, crocheting, baking, etc. Some of my favorite authors of this genre include Laura Childs, Josi S. Kilpack, Betty Hechtman, and Joanna Campbell Slan. I got interested in the historical fiction genre after being given The Other Boleyn Girl by Philippa Gregory. I loved the book and then went out and got all the other Tudor books that Philippa Gregory wrote. I have become obsessed with the Tudor period and have amassed quite a collection of books from authors such as Barbara Kyle and Kate Emerson as well as Phillipa Gregory. Of course, I do read the occasional romance novel and psychological thriller, but the above three are where most of my reading comes from. "They're in the car," Neil answered sheepishly. "You knew they were coming? Mother said you did, but I didn't really believe her, to be honest." His face was alight now, as if he had expected a protest. "And you don't mind?" Happy Friday Book Lovers! It's time again for another Book Blogger Hop!!! This fantastic idea to help the large community of book bloggers around the web get to know each other comes to us via Jennifer from Crazy-for-Books. Basically, this weekly BOOK PARTY is a place where book bloggers and readers can connect to find new blogs to read. It's a great way to find new blogs to read, make new frieds, support each other, and generally just share our love of books! It will also give blog readers a chance to find other book blogs that they may not know existed. 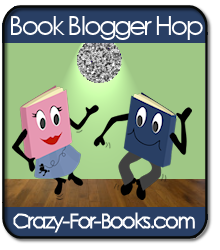 So, grab the logo, post about the Hop on your blog, and start PARTYING!! The rules are simple – Add your link to MckLinky, POST ABOUT THE HOP ON YOUR BLOG, and start hopping around and visiting other links that are posted! If you start following someone through the Hop, leave a comment on their blog to let them know! Stop back during the week to see other blogs that are added! So, head on over to Crazy-for-Books to sign up and see who else is participating. If you find my site through the Book Blogger Hop leave a comment here and I will come and visit your blog. I tend to gravitate towards current books. That's not to say that I won't read older books, but there are so many 'new' books out there that I haven't read. 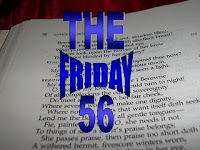 In high school, we did read a lot of the classics, and while there are many that I would like to reread, there are so many other books out there that I have never read and really want to. 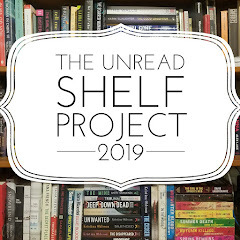 Now, on my TBR pile, there are books that were brand new (just released) when I got them and have yet to be read - again, so many books, not enough time! By the time I do get to read them, they may be considered old, but they will get read. So, short answer - current books for me! What about you? Back in March, I posted a review of Pieces of Happily Ever After by Irene Zutell. If you missed the review of this book, you can find it here. Today, Irene has agreed to answer a few questions. About the author: Irene Zutell began her career as a journalist. She has written for People, Us Weekly, The New York Times, the New York Daily News, Newsday, USA Today, and others. She lives in Los Angeles with her husband and two children. Thanks to Irene for agreeing to this interview. Lots of things. My neighbor left his wife for Julia Roberts. I wanted to do a book with the jilted wife, but she never got back to me. I thought about that premise a lot--a woman who is thrust into a spotlight because her husband leaves her for one of the most famous people in the world. She has to deal with the tabloids as well as watching her husband's romance unfold in public. How do you deal with that? So that idea simmered for a while. I thought it would be the perfect starting off point for a book about a lot of other things--a woman in the sandwich generation, a woman living in the bizarre world of the San Fernando Valley, a woman struggling with friendships, a woman trying to figure out who she is and what's next. I come up with a story idea first. But it's really the character that gets it started for me. I obsess about her and what she'd do in various situations. When I sit down to write out the plot, it's as if I've become this person. Okay, this will make me sound really old. But I remember watching The Waltons, and thinking wow, how cool that John Boy just sits at his typewriter all day and writes. I thought that would be a really great job. I wrote stories for as long as I can remember. I used to love rainy summer afternoons where we'd stay in and I'd write these elaborate stories. I read all the time--I loved the Ramona series, Harriet the Spy, The Great Brain books, Alice in Wonderland, to name a few. What's your writing routine? Do you write every day or just when the mood strikes? When I'm writing, I write every day--even if I'm not in the mood. I force myself. Lately, I've been so busy promoting my book and taking other assignments that I haven't been able to be creative. Although I have a bunch of ideas that I'd love to get started on! Let the Great World Spin by Colum McCann. Every sentence he writes takes your breath away. 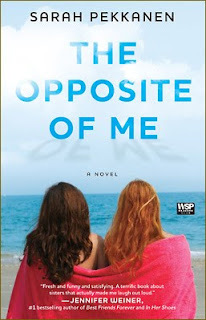 And I just finished The Opposite of Me by Sarah Pekkanen which I adored. Yes. My daughter is making me write a young adult novel. Yes, don't take advice from other writers! :) And most important, don't listen to the critics--because they'll always be critics. Just keep writing. Crystal at BookSparks PR has provided one copy of Pieces of Happily Ever After for readers of this blog! All you have to do is follow my blog and leave a comment. Be sure to include your email address in your comment. ~ Most likely I will be reading The Transformation of Bartholomew Fortuno by Ellen Bryson. After putting down the telephone the eighty-two-year-old birthday boy sat for a long time looking at the pretty but meaningless flower whose name he did not yet know. Then he looked up at the wall above his desk. I come from a huge family of readers. Both my parents are avid readers and reading was always been a big activity in my house growing up. We used to get books for good report cards, on birthdays, and on holidays. I'm lucky that my husband is also a huge reader - there are many Sunday afternoons that we spend on the couch each reading! He also comes from a family of readers. With all these readers - my immediate family of 9 and his of 4 - there are always plenty of books to be shared and recommended! I am so glad I participated in Bloggiesta! I got so many things done on my blog that I've been wanting to do. I also got to visit many wonderful blogs and see what everyone was working on. Of course, this lead to me constantly finding other things that I wanted to do on my blog - oh well, there's always next time! Visit the Blogging Tips group on the Book Blogs Ning and find ways to improve my blog. Overall, I put in about 18 hours. I had so much fun with this and am looking forward to participating in the next Bloggiesta! Thanks to Natasha at Maw Books for putting this awesome event together! Please bear with me as I am playing around with different templates/layouts. Things might be a little out of whack/messy for a little while. Last month I gave you a guest post by author Cynthia Roberts. 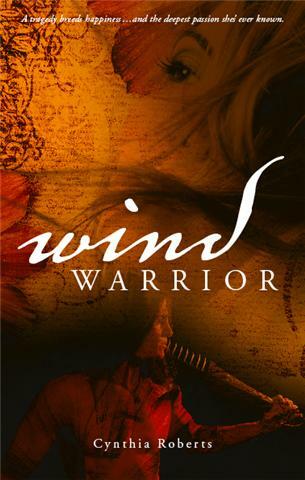 Well, the release date for Wind Warrior is almost here (June 15th) and Cynthia sent me the book trailer to share with you. I hope you enjoy it. First line: No one knew what triggered the Swandyke avalanche that began at exactly 4:10 PM on April 20, 1920. From the inside cover: On a Spring afternoon in 1920, Swandyke - a small town near Colorado's Tenmile Range - is changed forever. Just moments after four o'clock, a large split of snow separates from Jubilee Mountain high above the tiny hamlet and hurtles down the rocky slope, enveloping everything in its path. Meet the residents whose lives this tragedy touches: Lucy and Dolly Patch, two sisters long estranged by a shocking betrayal. Joe Cobb, Swandyke's only black resident, whose love for his daughter forces him to flee Alabama. Then there's Grace Foote, who hides secrets and scandal that belie her genteel facade. And Minder Evans, a Civil War veteran who considers cowardice his greatest sin. Finally, there's Essie Snowball, born Esther Schnable to conservative Jewish parents but who now works as a prostitute and hides her child's parentage from the world. Fate, chance, and perhaps divine providence all collide in the everyday lives of these people. And ultimately, no one is without sin, no one's soul is whiter than snow, and no one is without the need for forgiveness. A quintessential American voice and a writer of exquisite historical detail, Sandra Dallas illuminates the resilience of the human spirit in her newest novel. 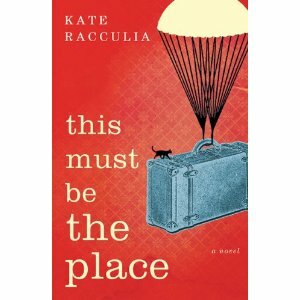 My thoughts: This was a very compelling book. I have never read anything by Sandra Dallas before and when I was asked to read and review this book, I gladly welcomed the chance. I was hooked from the beginning. It starts out with the events of the avalanche and then each subsequent chapter is about one of the parents/caregivers of the children. We really get a glimpse into their lives and come to find out why each child is so important to the adult. The final two chapters pull it all together and we get a glimpse of what happens in the aftermath of the avalanche. Sandra Dallas has a knack for storytelling and she creates memorable characters. She also is able to capture the essence of the time period and setting of her story. While this was a relatively quick read, it certainly had depth, delving into areas such as parent/child relationships, sibling rivalry, racial tension, poverty, loss, grief, marriage, love, and faith. It is a story that stays with you long after you finish reading. I am excited to have found Sandra Dallas and will be looking into reading some of her other works. About the author: Sandra Dallas is the author of nine novels, including Prayers For Sale, Tallgrass, and New Mercies. She is a former Denver bureau chief for Business Week magazine and lives in Denver, Colorado. Visit Sandra's website for more information about her and her other books. You can find an excerpt from Whiter Than Snow here. 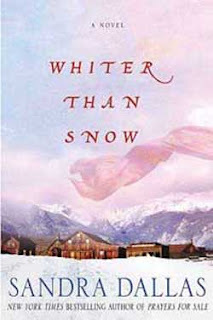 Thank you to Anne from The Book Report Network for sending me a copy of Whiter Than Snow by Sandra Dallas to review. Anne at The Book Report Network has provided one copy of this awesome book for readers of this blog! All you have to do is follow my blog and leave a comment. 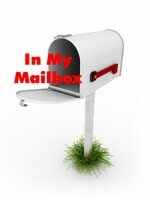 Be sure to include your email address in your comment. 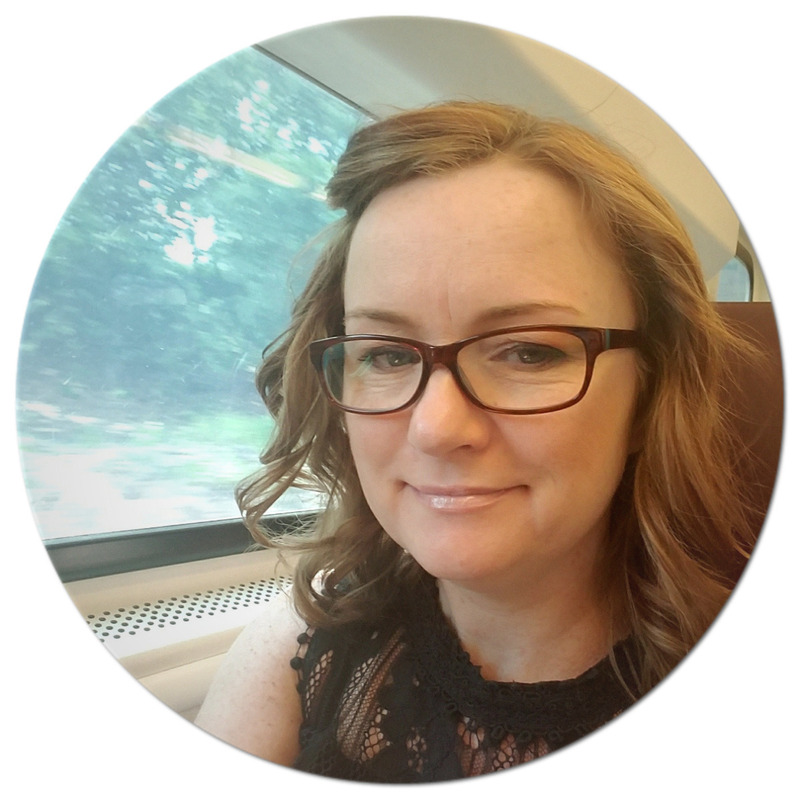 I am having so much fun participating in Bloggiesta! It's been so helpful and informative as I am still a relatively new blogger. I didn't get much done yesterday, as I was busy with errands and cleaning and then had to work for a few hours. Today, I have been lucky to monopolize the computer all day - the World Cup USA vs. England game is on and hubby is a huge fan, so he is in front of the TV and doesn't need the computer for the time being! Hope everyone is being as productive as I am!!! First line: I'm a stalker. From the back cover: Millie Barnes is this close to finally achieving her perfect life ... Rewarding job as a local doctor on Cape Cod? Check. Cute cottage of her very own? Check. Adorable puppy suitable for walks past attractive locals? Check. All she needs is for golden boy and former crush Joe Carpenter to notice her, and Millie will be set. 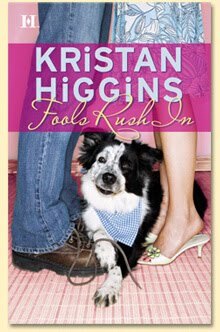 My thoughts: Yet another cute, funny, quick story by Kristan Higgins. This book has it all - characters who feel real and have you empathizing with them right away, a plot full of ups and downs, and great writing. Telling the story in the first person only adds to it - you feel like you are walking in Millie's shoes! In this debut novel, Kristan Higgins manages to pull at your heart strings on one page only to have you laughing out loud on the next. From the very first line, "I'm a stalker," I was hooked. The central theme of the book, that sometimes getting what we wish isn't all it's cracked up to be, is easy to relate to in everyday life. I will certainly be looking for more books by this author!